Masayoshi Son is flying close to the sun with his solar power ambitions. The SoftBank chairman has pledged to invest $20 billion in developing solar energy plants in India in the coming years through a majority-owned joint venture with India’s Bharti Enterprises and Taiwan’s Foxconn. India’s need for energy investment is clear but the synergies with the Japanese group’s existing businesses look dubious. The $72 billion company is best known for its Japanese telecom operations, controlling stake in U.S. mobile carrier Sprint, and 32 percent stake in Chinese e-commerce giant Alibaba. Less well known is its expansion into renewable energy following Japan’s earthquake in 2011. It now has 19 power plants in the country with a total output scale of 139 megawatts, and plans to expand capacity to 453 megawatts in the coming years. That is still a tiny fraction of the 20 gigawatts that Son has pledged to generate from solar in India – equivalent to one-fifth of the government’s total target by 2022. As the joint venture’s controlling shareholder, that puts SoftBank on the hook to raise project financing of at least $10 billion over the coming years. SoftBank must first win government contracts to develop solar plants, so its actual outlay may be much lower. Yet it still leaves investors with the problem of making sense of what SoftBank can bring to renewable energy. The company’s board questioned Son’s move into the business back in 2011, prompting the chairman to promise that total expenses would be no more than 1 percent of SoftBank’s total assets, which stood at 16.7 trillion yen ($162.2 billion) at the end of March 2014. It’s hard to see how the Indian foray can be reconciled with that spending cap. Son may see potential for selling electricity to Indian mobile phone users, where Bharti is the leading player. But SoftBank has yet to clearly demonstrate the link works in Japan, where its renewable investments are at a much more advanced stage. Shareholders can only hope the board clips the chairman’s wings before he flies even closer to the sun. 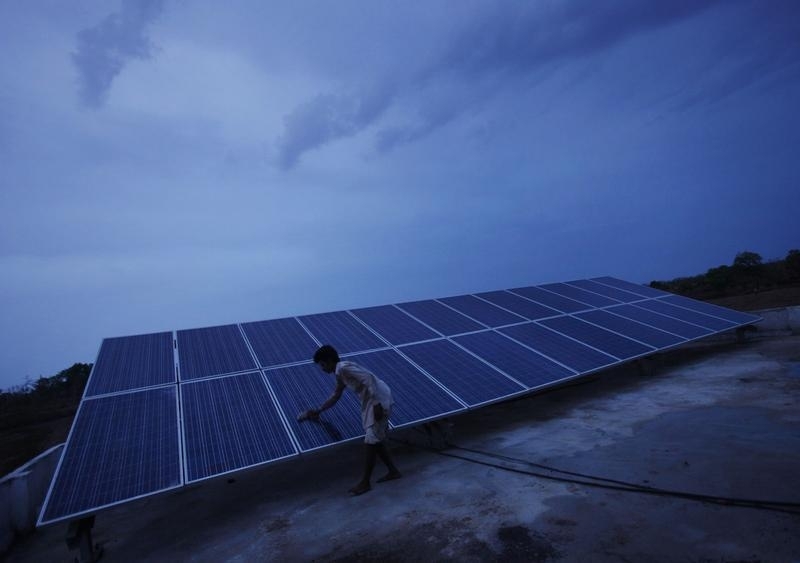 A man cleans panels installed at a solar plant at Meerwada village of Guna district in the central Indian state of Madhya Pradesh June 18, 2012. Japan’s SoftBank Corp, India’s Bharti Enterprises and Taiwan’s Foxconn Technology said on June 22 that they are teaming up to invest about $20 billion in solar energy projects in the country. SoftBank will have majority control of the joint venture called SBG Cleantech, which intends to bid for contracts to develop solar power plants in the country. The joint venture will aim to generate 20 gigawatts of electricity from solar power, Masayoshi Son, chairman and chief executive of SoftBank, told a press conference in New Delhi. That translates into about $20 billion of investment, he said. The company will also invest in wind energy plants across the country. SoftBank’s wholly-owned subsidiary, SB Energy Corp, has 19 solar plants in operation in Japan and is preparing to operate at least eight more renewable plants in the country. India has set a target to generate 100 gigawatts of energy from solar and 60 gigawatts from wind by 2022, the companies said in a joint statement. SoftBank shares were up 1.3 percent at 7,418 yen by midday local time in Japan.